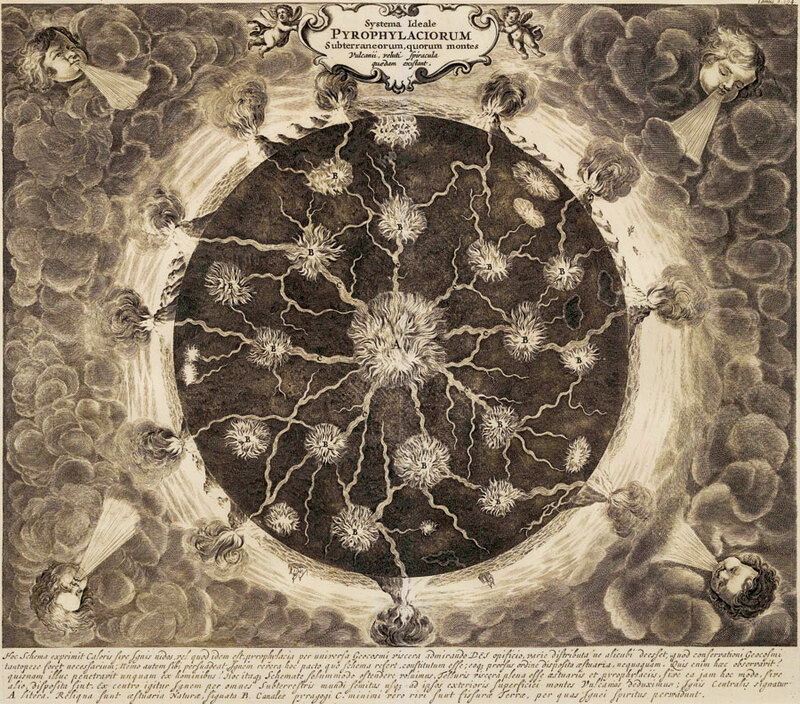 This copper engraving entitled “Fire Canals” is an early 3D diagram of volcanology; it’s a cross-section of the Earth showing volcanoes on the surface forming from a molten magma core. Note the ships sailing between erupting volcanoes, blown by the four winds. This model was created by the Jesuit scholar and polymath Athanasius Kircher (1620 – 1680). In his book, Mundus Subterraneus (“Underground World”), Kircher describes the physical appearance of the Earth using semi-scientific knowledge—becoming one of the first to do so in history. Kircher was a German Jesuit scholar who published major works on the subjects of geology, medicine, and Oriental studies. He also practiced as a Catholic priest. He was one of the first people to observe microbes under a microscope and has been attributed with inventing the magnetic clock. This beautiful piece is on display at The Map House in London. To learn more, check out themaphouse.com or email them at maps@themaphouse.com. Image Courtesy of The Map House.